Growing up, Rowan & Martin’s Laugh-In was on too late for me to stay up & watch; it began airing in 1968 when I was just four. But hearing my parents talk about the show, I wanted to see it in the worst way. So eventually my whining bore fruit; mom sent me to bed with my younger sister, but as she tucked me in she whispered in my ear, “Just pretend to sleep — I’ll come back and sneak you out past your sleeping sister before the show starts.” I was so excited! But that must have been too much excitement for me because mother found me passed-out, sound asleep, when she came back for me — but my little sis was awake and she got to watch the show! Drat! Just another reason for a little girl to dislike her little sister. As the show ran until 1973, I eventually grew old enough to stay up and watch it — not that I understood most of it. Laugh-In was a show built on political humor and sexual innuendo; not something your average kid knows. Well, I understood enough to know there was naughty stuff… and most of the cultural comments were even further over my head. But Arte Johnson was wacky enough for me to genuinely giggle at. 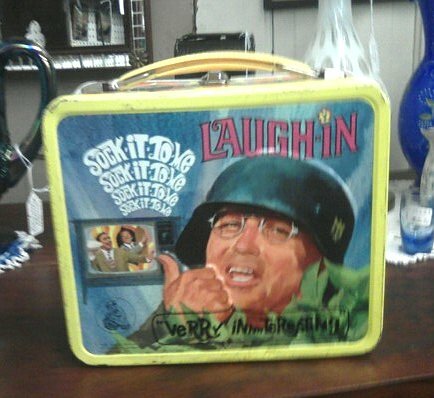 All of this came flooding back when I spotted this old Laugh-In lunch box at a local antique mall this past weekend. 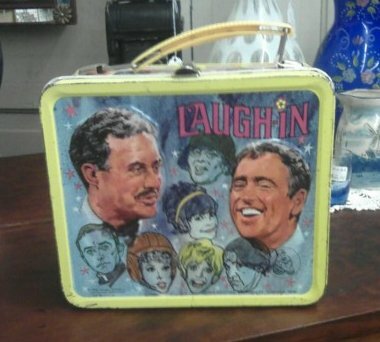 But what really makes this find noteworthy is the fact that Rowan & Martin’s Laugh-In was not a television show for kids — so why make kids’ lunch boxes? I mean kids didn’t understand the show — and by the time they would have, wouldn’t they be too old for lunch boxes with thermoses? I can imagine the beating 16 year olds took for toting mom’s PB&J in a lunch box. 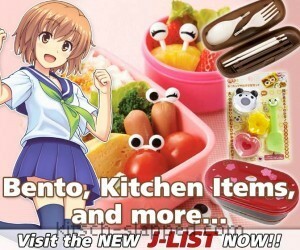 So just who were these lunch boxes with “Sock it to me” on them marketed to? Kids who, like me, wanted to watch the show because their parents thought it was cool? 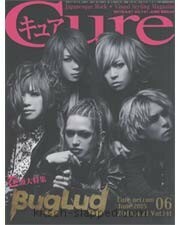 Parents, who wanted their kids to look cool? Well, it seems to me that in the late 60’s to early 70’s parents didn’t push their kids to look like mini-adults like they do today… And while there weren’t the same judgments & finger pointing at parents for kids having risqué knowledge (hey, back then we kids traveled in cars without seat belts, even riding on those backseat ‘shelves’ under the rear windows, and we kept our parents company in taverns without any finger or tongue wagging), parents hadn’t yet given into the permissiveness of letting the children dictate to them, especially about adult things. We sat in taverns because parents wanted to go, we rode in the car that way because no laws yet forbade it, and we got Disney and Muppet stuff because we were kids. It was just that sort of upbringing which makes me covet such a lunch box. It’s familiar & nostalgic, but it was never mine because I was too young — now that I’m older, I want it bad.